That was nice of you to set up a FreeBSD box for your Mom. There isn't a lot of work maintaining one IMO, stuff you could probably get by doing on a weekly basis for her as far as updates, and if she just uses it to surf the net, checks her email, etc. she'll be doing it in style. Since she used DOS back in her days where she started working making digital docs for her work ( she even remembers a little of Lotus123 ), she isn't afraid of terminal and when she used ubuntu she kept complaining how the ubuntu updater was garbage so I taught her to use the "apt update" and "apt upgrade". So in the end I just said "you update this system like ubuntu but switching "apt" for "pkg"", in the end she updates her system. I upgraded the HDD in this Thinkpad T61 to a 250GB WD Scorpio Black and built all the 3rd party programs with the new version of ports-mgmt/portmaster. You can get that wallpaper at my site. The X61 I use to listen to music. Doesn't bother your eyes so much white? I prefer a dark background personally but it's probably no worse than looking at a text file fullscreen. FreeBSD 11.1-R-p6 & i3WM with conky as a replacement for i3status. I used to run i3 with the i3 bar backed by conky. I did the same thing a few years back on GNU/Linux but today I felt that I had to change that boring i3status with something else and sice i3blocks fails to build on FreeBSD I've chosen conky. When I have time I'll try i3pystatus. 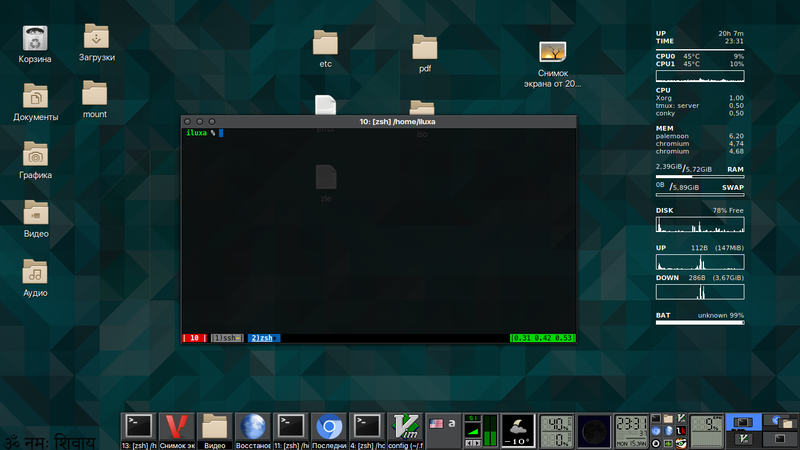 Basic Xfce w/Arc theme and Arc/Paper icons. FreeBSD 11.1-RELEASE on my iMac 21.5 (late 2013). Would you mind telling which WM are you on, and what Music player are you using (Is that possibly ncmpcpp?)? Hi, Thanks! It's openbox and tint2 bar that you can see, using font awesome icons and musicpc commands to control the mpd backend. Oh, and yes, that is ncmpcpp in one of the pictures that you can see also. tint2 bar -- didn't know it could do this stuff! All the buttons work. The Thinkpad X61 running FreeBSD 11.1-RELEASE-p4 that serves as my .mp3 player. Minibari, would you please PM me in regard to a question I have about your screenshots? I can't start a conversation with you. Yay! i3blocks on FreeBSD. It's not polished yet but it's funcional.